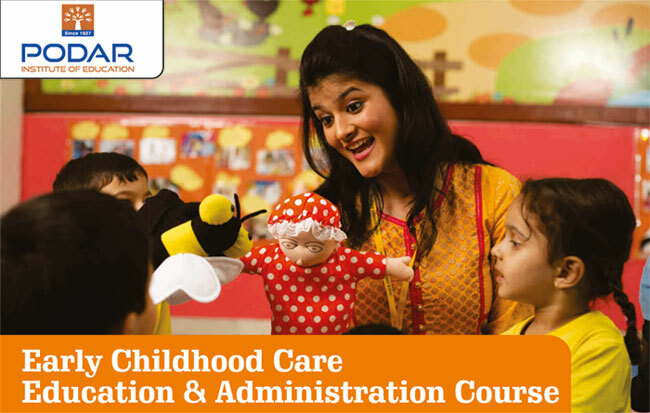 The Early Childhood Care, Education and Administration Course is designed to prepare learners to work with children between birth to eight years. The Early Childhood Care and Education course aims to provide theoretical knowledge and an understanding of principles of early childhood education, based on child development. This course enables the learners to acquire attitudes and skills to work with children from 0-8 years using play way methods. This course will equip learners to organize, plan and administer preschool programs and work effectively with parents and the community. Learner should be at least 16 years old and have passed the 12th exam. It is a one year programme. Students will be assessed on their individual work for every module in the programme through interactions, tests, and submissions of different projects. On completion of the Programme, the learner will be awarded a Diploma in Early Childhood Care, Education and Adminstration by Podar Institute of Education. Is internship compulsory for this course? Yes, Learners must intern for four hours a day, five days a week. What if a learner is already working as a preschool teacher? Then, the learner's work hours will be considered as internship hours. Module 1 - Early Childhood Care and Education. Module 2 - Contributions in Development of ECCE. Module 3 - Trends & Policies in ECCE. Module 2 - Elementary Principles of Nutrition.